Okay, you kiwis and pee-lots, listen up! This is Sergeant Saturn letting you rascally rocketeers know that when you fans of a certain classic cosmic crusader send enough feedback, the Big Poobah at Haffner Press has little choice but to give you what you want. To that end, be it known that sometime, sooner than later, you will be able to add THE COLLECTED CAPTAIN FUTURE, VOLUME ONE to your already stellar library in a revised 2nd Edition. and we’ll share more information as it becomes available. So, prime yer rockets while Mr. Wart Ears here goes to the galley for another jug of Xeno. Edmond Hamilton (1926-1977) was a pioneer of American science fiction who began his writing career during the 'Golden Age' of pulp magazines. He sold his first story, 'The Monster-God of Mamorth" to Weird Tales magazine in 1926 and became a prolific contributor to the science fiction pulp magazines of the 30s and 40s. He was writing and getting published through the 1960s, even as the popularity of science fiction action/adventure tales of the kind he specialized in was fading. Now under the deft and expert editorship of Stephen Haffner, Haffner Press is bringing out deluxe editions comprising all of the Edmond Hamilton stories, beginning with "Captain Future", a quintessential science fiction hero who, along with his three companions (a sentient robot, a synthetic android, and a disembodied brain kept alive in a serum-case) protected the solar system against all manner of villains and menaces. 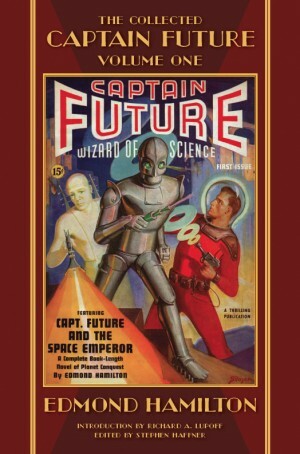 Captain Future was such a popular character that it became the title of one of the many science fiction pulp magazines of the day. Now all those wonderful science fiction adventures of yesteryear are available in a single 776-page volume. Also very highly recommended for dedicated science fiction fans and made available by Haffner Press is a collection of Edmond Hamilton stories originally published in the pages of Weird Tales magazine (along with two that were published in Amazing Stories Quarterly and one printed in Science Wonder Quarterly): "The Collected Edmond Hamilton: Volume One: The Metal Giants And Others" and "The Collected Edmond Hamilton: Volume Two: The Star-Stealers: The Complete Tales of the Interstellar Patrol". "One more title for tonight, also a deeply-appreciated review copy: The Collected Captain Future, Volume One, from Haffner Press. 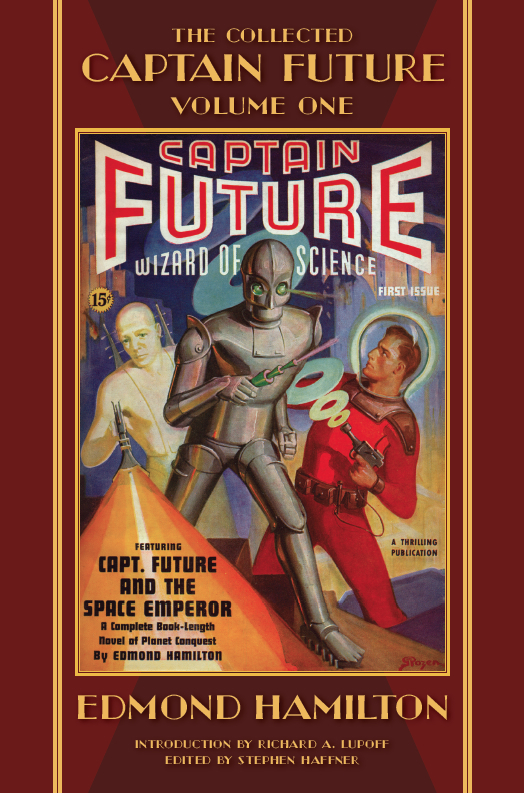 Edmond Hamilton was the quintessential space opera writer of the 1930s and '40s, but he was an author I had never read: with this book in hand, I read the 150-page long title story, "Captain Future and the Space Emperor", first published in 1940. It is a hoot; it is a casebook of prose the like of which is described in writing courses under the heading *do not write like this* -- a compendium of "said-bookisms" such as "he muttered sickly to himself", "the President asserted confidently", "the thing gasped hoarsely", and so on and on. But more than that, it's a tale of simple presumptions about space flight and planetary natives and easy villains with unironic tags like "space emperor"... So unironic that it's hard to believe anyone could have read this stuff without choking. Isn't there a lesson here, though, about context and presumptions and relative sophistication? Might we reflect on what has or has not changed since then? As an example, here back in 1940 two of Edmond Hamilton's characters debate about who or which is most human... a debate carried on in subsequent decades by Isaac Asimov and STTNG's Data and all the way to Bernard Beckett's Genesis. Some things never change; some debates seem never to be resolved."